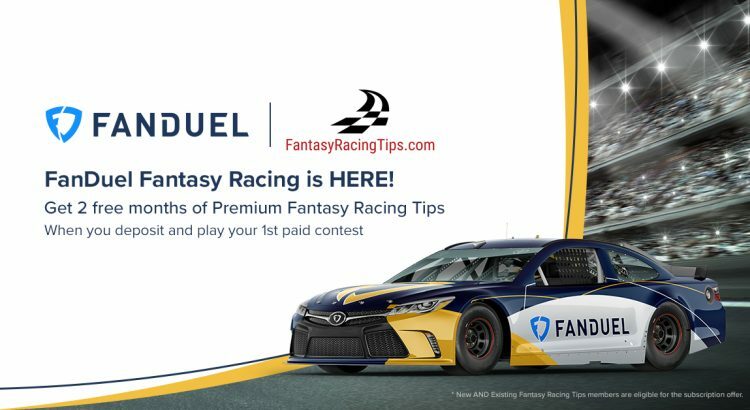 I’m still getting the feel for the new FanDuel NASCAR Contests. The scoring is not like any other Fantasy NASCAR game. After I looked at the scoring from the previous races at Kansas I have a better feel for the strategy that will score well this week. Scoring for FanDuel will be more focused on where a driver finishes the race than how many laps he leads or how many positions he gains in the race. There are no points awarded in FanDuel for fastest laps and that is a good thing. The 0.1 point for every Lap Completed means you will need drivers who finish on the lead lap. If your driver crashes early in the race, your lineup is toast! So make sure you select the drivers you think will finish up front and complete all of the laps when you fill out your FanDuel Lineups. The trend in the last 4 races at Kansas is to have 28 cars finish on the lead laps. Since cautions are way down this season I would expect 30-32 of the 38 cars to finish on the lead lap. For this reason we do not need to worry about laps completed this week. There are only 267 laps in the race and 26.7 points available for leading laps. The trend at Kansas is to have 2 drivers score 20 of these points for leading laps. I will use practice times and past performance at Kansas to find these 2 drivers for my lineup. Our main focus this week will be on finishing position. We need to have as many drivers as possible who finish in the top 10 in order to score well Saturday night. Kevin Harvick ($13,500) should be the best pick for the race at Kansas. Harvick has two wins at Kansas (2013 and 2016) and 4 wins this season. Stewart-Haas Racing has the cars to beat and Harvick is their best driver. His average finishing position in the last 5 races at the 1.5-mile tracks is 1.8 (Includes wins at Texas, Atlanta and Las Vegas). Harvick is also a good pick for the bonus points for winning the pole. Harvick has 3 poles at Kansas. I plan to keep using Harvick until he cools off. Martin Truex Jr. ($12,500) has been the best driver at Kansas in the past four races at the track. He won both races at Kansas last year, led 195 laps and won 3 of the 4 stages. The No. 78 car has been very good on the 1.5-mile tracks but has had some bad luck which prevented him from winning the races. I expect his luck to turn around this week. The No. 78 is so good at this track that they should name Victory Lane after him. Kyle Busch ($12,200) used to really struggle at Kansas and then Carl Edwards came to Joe Gibbs Racing and taught Busch to secret to turning fast laps at this track. Ever since then Busch has been one of the best Drivers at Kansas. He has finished 6 consecutive races at Kansas in the top 10. His average finishing position since his talk with Edwards is 4.8. Busch will be a great picks this week. Ryan Blaney ($11,500) should be in every lineup this week. This is the best track for Blaney. He finished 3rd and 4th in the two races at Kansas Last year. He also won the pole and led 83 laps in this race in 2017. Blaney has been pretty good on the 1.5-mile tracks this season. He is coming off back-to-back top-5 finishes at Las Vegas and Texas. I expect Blaney to qualify up front, lead some laps and finish in the top 5 Saturday night. Kurt Busch ($10,600) has been very good at Kansas in his career. His average finishing position in the last 6 races at Kansas is 8.5, including a 2nd-place finish last October. Busch has also led laps at Kansas in 2 of his last 3 races at the track. Busch has run very well on the 1.5-mile tracks this season. He finished 8th at Atlanta (led 52 laps) and 7th at Texas (led 40 laps). Busch is a great pick for your team this week. Clint Bowyer ($10,200) has never run this well in his career. It is no secret that winning a race at his home track in Kansas is very high on his to do list. I am sure Tony Stewart will provide Bowyer one of their best cars this week so he can add a win at Kansas to his resume. Bowyer finished 3rd at Atlanta and 9th at Texas. I expect him to run in the top 10 again Saturday night. Aric Almirola ($9,400) took a hard hit at Kansas last year and broke his back. You would think he would be afraid to come back to this track but that was not the case. Almirola finished 9th in the October race at Kansas after his wreck last May. Stewart-Haas Racing has been awesome this season. I expect Almirola to finish in the top-12 Saturday night. Kasey Kahne ($8,200) has been running pretty well in the No. 95 car this season. Kansas has been a good track for Kahne so I expect him to run well Saturday night. His value will increase a lot if he qualifies outside the top 20. Matt Kenseth ($9,600) will be driving the No. 6 car for Roush Fenway Racing this week. Kansas is one of his best 1.5-mile tracks. He has 2 wins at the track and a 12.7 average finishing position. I will be watching Kenseth closely in practice. If he has any speed I will have him in many of my lineups this week. David Ragan ($6,000) will be a good cheap driver if you plan to spend up for the more expensive drivers this week. Ragan has been running well since Front Row Racing has received cars, engines and notes from Roush Fenway Racing. This week Ragan will get to share information with Matt Kenseth. That can only help this team this week. If Ragan qualifies outside the top 25 he will be great pick for your contest. – Be sure to check FantasyRacingTips.com Saturday morning for my updated FanDuel lineup!! If you need any further advice with your team or want to see my updated picks after Happy Hour practice, look for me on Twitter (@MrFantasyNASCAR).